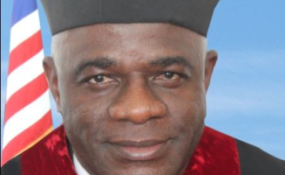 The House of Representatives has snubbed a stay order issued by the Supreme Court of Liberia against ongoing legislative processes to impeach Associate Justice Kabineh M. Ja'neh. Two representatives of the ruling Coalition for Democratic Change (CDC) Moses Acarous Gray and Thomas Fallah have filed a bill to impeach Justice Ja'neh over claims of proved misconduct, misuse of power and corruption. But Justice Ja'neh's lawyers ran to the Supreme Court, filing before Justice presiding in Chambers Associate Justice Sie - A - Nyene Yuoh a petition for a writ of prohibition dated 2 August against the impeachment of the accused justice by lawmakers. Upon the filing of the petition for a writ of prohibition by Justice Ja'neh's counsels, Justice in Chambers Yuoh on 8 August ordered the House of Representatives to stay all further proceedings in the matter and return to status quo ante. "You are commanded to instruct the Respondents to stay all further proceedings in the matter, and that the parties are ordered returned to status quo ante, pending the disposition of the petition," Justice Yuoh orders. She further instructed that the lawmakers to file their returns to the writ on or before 18 August. But during the House of Representatives' regular session on Tuesday, 14 August, the lawmakers defied Justice Yuoh, insisting that they would continue with their proceedings and won't appear before her. They made known their defiance to Justice Yuoh's instruction after one of the representatives made a motion requesting that the House send a communication to tell her that they are not going to appear before her. One of the crafters of Justice Ja'neh's bill of impeachment Montserrado County District #8 Rep. Moses Acarous Gray says the action of the Supreme Court is a direct attack on the House of Representatives. He claims that it is also intended to impede legislative function and bring them to public disrepute. Rep. Gray argues that there is no time in the history of Liberia that a bill has been halted by the Supreme Court of the Republic of Liberia. According to him, if anyone wants to challenge the bill, it first has to be passed and signed into law. Rep. Gray is requesting that the Justice be held for "theft of property" on grounds that he has not yet been served with any copy of the bill in question and yet he got it. Gray wonders "how he got it?" But Nimba County District #5 Rep. Samuel G. Kogar counter argues that the Supreme Court has the power to put stop to any constitutional matter. He filed a motion for reconsideration, but it was defeated by members of the House of Representatives.